Kitchen Cabinets and Granite Countertops, Pompano Beach FL > Blog > Blog > How Big Is The Average Kitchen? How Big Is The Average Kitchen? There are small kitchens, mid-sized kitchens and large kitchens, all of which vary greatly in size but tend to follow similar measurements in terms of workspaces. The average small kitchen measures 70 square feet or less. The average mid-size kitchen measures 100 to 200 square feet. 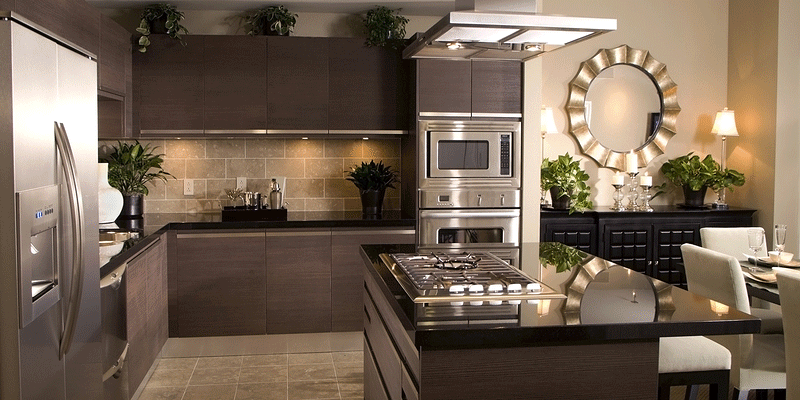 The average large kitchen measures over 200 square feet. It’s impossible to know if you prefer a small, mid-size or big kitchen until you’ve cooked in all three spaces. Some people prefer a smaller footprint because it means less work getting around the kitchen. Others like to spread out and use as large a space as possible, or need the larger space for entertaining. The actual size of your kitchen will depend on the square footage you’re working with, overall budget, design style, needs followed by wants and building codes. Here are a few questions you can consider in order to determine just how big your kitchen needs to be. -How many people will be cooking in the kitchen? If you live in a one-cook household you really only need room for one chief to operate at a time. On the other hand, if you like to cook in pairs you’ll want to consider additional cooking and prep space. -How many kitchen appliances do you have and regularly use? If you haven’t used a certain kitchen appliance in years you may want to consider giving it away or storing it out in the garage. Out of the appliances you use on a somewhat regular and very regular basis, how many are there? Of these, which can go out on the countertops and which need to be put away in cabinets and drawers? These questions and answers will determine how much cabinet and countertop space you require. -How often do you cook? If you love to cook and do so regularly you may want to consider a bigger kitchen to accommodate your needs. If you cook more you also keep more groceries on hand at any given time, which means you’ll need more cabinet space and a larger fridge to accommodate additional food. An open kitchen is open to other parts of the house and includes its own dining area. These types of kitchens tend to be bigger in order to accommodate dinning space, and they also tend to feel bigger because they lack enclosing walls. Closed kitchens are walled off from other parts of the house as well as the dinning area. A great example is a galley kitchen, which typically does not include any sort of seating space but is instead a functional kitchen in a compact narrow space. Closed kitchens tend to take up less square footage, but implementing the correct design ideas can help keep the space feeling open as opposed to closed off. Another option is a partially open kitchen, which may include a dinning area but still remains completely or partially closed off from the rest of your home. Countertops are one of the most important components of a kitchen remodel. The average guidelines recommend countertops measure 158” x 24” deep and have at least 15” clearance above. This translates to 13-feet of countertop length and 26.3-square-feet of usable countertop space. If you have the space you will likely want to expand on these measurements. The kitchen work triangle accommodates the three most common kitchen tasks: storage, prepping and cooking. The work triangle connects the fridge, cooking/prep space and the sink. The best workspace measures 21 linear feet, if your work triangle exceeds 26-feet it can become quite cumbersome to get around and get things done. No matter how big or small your kitchen may be you want to keep your work triangle within suggested guidelines. -Sink area for washing dishes, should be located next to the dishwasher. If you want more than one sink make sure to take note of this. -Prep space where you’ll cut, chop and prepare foods for cooking. -Stove top, oven and cooking space. -Storage space for food and kitchen appliances. -Entertainment area(s) for a bar, kitchen table and other guest-friendly accommodations. There may be additional features you want to include, such as a coffee-making station, wine fridge or television. Special considerations include the size of your family, are there 2 people or 10 people that live in your home? How often you entertain is also important, as more entertaining equates to a greater need for space and an open kitchen floor plan.